Laura Shoopman will be one of five seniors looking to create a legacy for Westosha Central in 2018 (Mike Ramczyk File Photo/The Report). 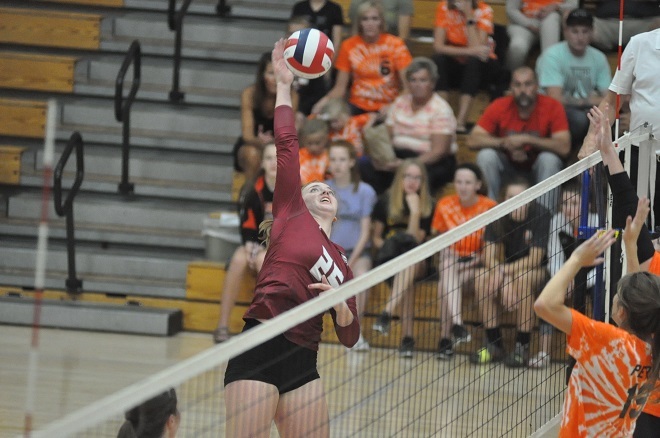 Returning a bulk of its lineup from last season, when the team reached the WIAA Division 1 sectional girls volleyball final, Westosha Central High School looks to make another strong push in the post-season for 2018 and establish a new legacy. Westosha Central, which lost honorable mention all-Kenosha County Kaitlynn Ellis to graduation, welcomes back seven letter-winners from the 2017 squad. Of the seven returners, five are seniors, consisting of Kennedy Muff, Sierra Lee, Laura Shoopman, Ella Kaebisch and Twila Dovas. Additionally, the Falcons return juniors McKenna Hall and Shelby Serrittella. With a senior-laden team, second-year coach Megan Awe believes her squad is poised for a solid season, including a battle for the top spot in the Southern Lakes Conference. “We are looking to battle for the top spot in the Southern Lakes Conference, as well as make a strong push in the post season as we return a plethora of experience to this team,” she said. Last year, the Falcons finished second in dual matches (6-1), fourth at the conference meet, and placed third behind Waterford and Burlington in the final conference standings. The experience, meanwhile, includes multiple letter winners who garnered conference and state recognition. Earning honorable mention all-state were Muff, a 5-foot-10 setter who picked up first team SLC honors, and 6-2 outside hitter Shoopman, who was named to the SLC second team. Lee, an outside hitter/defensive specialist, earned second team SLC and also joined Muff and Shoopman on the Kenosha County first team. Kaebisch, a 5-11 middle hitter, was named honorable mention SLC and second team all Kenosha County. Dovas was added as honorable mention for the both the SLC and Kenosha County. Shoopman (537), Lee (400) and Kaebisch (188) were the team’s top three kills leader last year. Muff accounted for 975 assists and led the team in points with 216. Hall, an outside hitter/defensive specialist, was honorable mention all Kenosha County. She logged a team-leading 55 service aces and finished second to Muff in points at 201. Dovas, meanwhile, notched 348 digs. Newcomers to the team are juniors Maggie Pelli (defensive specialist/setter), Alexis Rothwell-Krebs (middle hitter/right side hitter) and Ava White (defensive specialist/setter). According to Awe, each of the newcomers bring energy and positive attitude. While Pelli and White bolster the back row, Rothwell-Krebs looks to strengthen the front row, Awe said. As the Falcons start their season, Awe hopes the team leaves a legacy, which is this year’s theme. The decision, she said, hinged on the five seniors, three of which have played on the varsity squad since they were freshmen. The seniors are Muff, Shoopman and Lee.